Water features have always been an important element of garden design. From meandering, natural streams to custom-made pools and backyard waterfalls, the sight and sound of water has a unique soothing and rejuvenating effect on everyone. Total Lawn Care, LLC can add this calming ambience to your residential or commercial landscaping by installing stunning landscape water features. We have a team of highly creative landscapers who can build strategically placed, stylish water features that make your landscaping an oasis straight out of your dreams. When it comes to mesmerizing landscape water features, nothing can beat backyard waterfalls. You too must find the prospect of accentuating your landscape with striking backyard waterfalls quite thrilling. 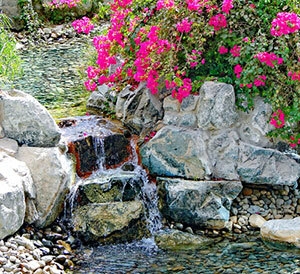 We can work with your space and budget to create the ideal backyard waterfalls for you. As the descending water offers a delightfully beautiful view, its melodious sound creates a magical setting. We won’t blame you if you mistake your backyard for a far-away retreat that is nothing short of paradise! 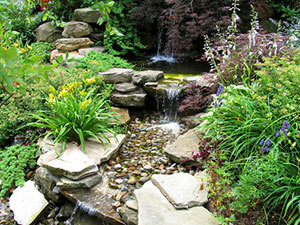 Landscape water features are inherently attractive and tend to be the focal point of the landscaping. Tastefully designed and well-maintained landscape water features can take the beauty of the landscape to another level. Using our utmost creative abilities, careful processes for installation of water features, and high quality materials, we assure you of landscape water features that make your yard or garden a sanctuary to please all your senses. If you are interested in installing landscape water features on your property, call Total Lawn Care, LLC at 253-777-4664 today!